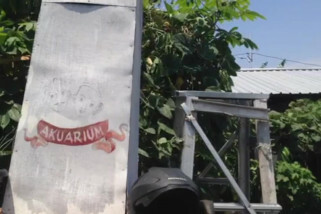 Jakarta (ANTARA) - Reeling under Jakarta’s scorching heat, 35-year-old Topaz Juanda drove his motorcycle to North Jakarta's Luar Batang and Muara Baru coastal villages to reach out to Kampung Akuarium’s ex-residents, whose homes were bulldozed three years back. Juanda, one of the former residents of Kampung Akuarium, willingly made the trip to go door-to-door notifying his former neighbors of being registered for voting for the presidential and legislative elections at two polling stations in Kampung Akuarium on Apr 17 and to appeal to the public to not refrain from exercising their right to vote during the elections. One wonders what drives a person to take up an unpaid task of approaching the people to cast their ballots? The answer perhaps lies in the forced eviction three years back. The gruesome image of some bulldozers ripping through several hundred houses in Kampung Akuarium continues to dodge Juanda’s memory, nothing short of a nightmare. Recalling how their homes crumbled down, Juanda and several hundred ex-residents of Kampung Akuarium are firm believers that the elections will be a vital passport for supporting their fight to return home and start afresh. Kampung Akuarium was an informal urban neighborhood in the northernmost coastline of Jakarta, located in proximity to the historical site of Sunda Kelapa Port. The area served as a research field, owned by the Indonesian Institute of Science (LIPI), to store some specimens in aquariums. Close to the laboratory were some square meters of land as a residential complex for the scientists. Hence, the neighborhood was called “Kampung Akuarium”. Moving ahead in time, several migrants from Sulawesi, Sumatra, and Java began residing in the area when LIPI's laboratory was shifted to Sunter Sub-district, North Jakarta. The migrants then began staying in Kampung Akuarium for decades, while they worked as fishermen, factory laborers, and merchants at the Muara Baru fish market. During Basuki Tjahaja Purnama's (Ahok's) term as Jakarta governor between November 2014 and May 2017, the provincial government declared the neighborhood as a cultural site. As a consequence, houses standing there for decades suddenly became illegal structures. With merely a brief notice of 11 days, on April 11, 2016, Ahok razed down all houses in the neighborhood while deactivating the identity cards (KTP) and family registration cards (KK) of the residents to make their residence status null and void. Kampung Akuarium's residents expressed their objection to the eviction by backing Ahok’s challenger Anies Baswedan for the 2017 regional election. Ahok had to taste bitter defeat after the people lent overwhelming support to Baswedan as a strong voter base during the election. Elected governor Baswedan thereafter assumed office and pledged to soon rebuild homes for the residents. To get matters in motion, Baswedan firstly conducted rehabilitation of Kampung Akuarium by building 90 shelters while starting the reissuance of the residents' identity and family registration cards. Head of the North Jakarta Population and Civil Registry Office Erik Polim Sinurat gave a confirmation that from January to April 2018, the city government had handed out 85 family cards and reactivated 166 electronic identity cards for residents staying in the shelters. Over and above, Kampung Akuarium's people continue to look for full rehabilitation to their neighborhood since merely temporary shelters would not help them get their lives back on track. The public demands permanent housing and a guarantee of not being re-evicted by those in power. “The elections are critical for us. We want to cast our ballot for candidates offering programs focusing on the full rehabilitation of Kampung Akuarium. We are upbeat that a full restoration at Kampung Akuarium would bring back our neighbors and families still scattered in some locations in Luar Batang, Muara Baru, Marunda, Kapuk in North Jakarta, as well as Cakung in East Jakarta,” Juanda emphasized. Prior to the residents being evicted, Kampung Akurium had two neighborhood units RT 12 and RT 01 home to a thousand residents. However, following rehabilitation, just one neighborhood unit remains and had some 400 people. Two polling stations will be readied in the neighborhood for the 2019 elections. Topaz, head of the local poll administrator (KPPS), noted that polling station No. 33 and No. 40 at the Kampung Akuarium will enable the people to exercise their right to vote. He reported that 482 registered voters will cast their ballot in Kampung Akuarium on Apr 17. Commissioner of the Jakarta General Election Committee (KPUD) Partono had made assurance that Kampung Akuarium's residents were registered as eligible voters for the elections in spite of several of them moving out of the neighborhood. "On April 17, current and former residents will cast their ballot at two polling stations in Kampung Akuarium, but those looking to vote outside the neighborhood should ask for the A5 form from the election committee," Partono explained. In the run up to the elections, Kampung Akuarium residents have closely followed the process, including the campaign as well as presidential and vice presidential debates. The group had organized a screening in the neighborhood’s main public area when the debates were televised. Local leader Dharma Diani, 42, remarked that the screening was organized independently, with funding by the community. Diani addded that her neighbors had lent the projector and speaker, while several dozen plastic chairs and a tent were taken on rent from a local supplier. People began building the tent four hours prior to the screening generally aired at 8 p.m. local time. Diani opined that the 2019 elections differ from that in 2014 on account of the fact that there is greater political awareness among the pubic regarding candidates. “I now notice that some of my neighbors no longer take the elections for granted, as they learnt about all programs that the candidates were offering. Most people here will only vote for candidates vowing to back our rehabilitation,” Diani pointed out. Diani pointed out that not many candidates had offered programs centering on the neighborhood’s restoration. “We already know who will be chosen during the elections,” she stated, falling short of speaking at length about the candidates or their political parties. When the fourth presidential debate was screened on March 30, almost 100 people thronged the event, comprising several dozen women wearing blue scarves and green t-shirts, whereas some men were spotted in tops bearing images of one of the presidential pairs. When the debate kicked off, cheers were audible from the crowd. After the debate, Rini Ernawati, 62, pledged her vote to presidential candidate Prabowo Subianto since his running mate Sandiaga Uno had lent support to the community when they were struggling from the forced eviction. “We would not turn our face to other presidential candidates, as right now, what matters the most is a real action, not promises,” she affirmed. Seconding Enarwati's views, Musdalifah, 32, a mother of one, affirmed that she and the people of Kampung Akuarium had laid their trust on the election process since the elected president and legislative members will play a decisive role in their future. “If we select the wrong candidate, we might get re-evicted,” she remarked, her seven-month-old infant in tow. Incumbent presidential candidate Joko Widodo, pairing with Ma’ruf Amin, will clash against challenger Prabowo Subianto and his running mate Sandiaga Uno for the presidential election. Indonesia will organize its first-ever simultaneous presidential and legislative elections on April 17. The people of Kampung Akuarium believe that the 2019 elections are not a mere celebration of democracy, but transcends beyond that realm, as an opportunity to cast their ballot to echo their aspirations to return homes as well as call on families and neighbors to return to the neighborhood where they earlier lived for generations.